The Sensi two-component fertilizer line is easy to use. A special formula gives your flowers all the micro and macro elements they need to optimally grow and produce flowers. Competitive fertilizers do not have the right combination of elements: tests have shown that some of them actually slow down and reduce flowering. Sensi Grow 2-part contains various types of important and less important nutrients. They are carefully arranged so that the plants produce delicious flowers. 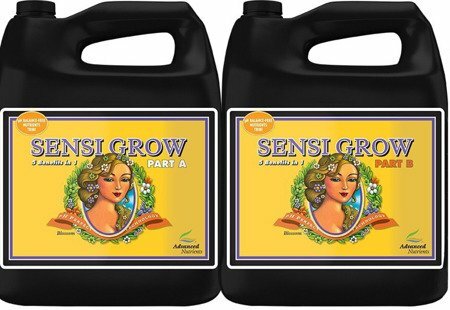 Sensi Grow in 2 parts is a comprehensive nutrition program for hydroponic and more. It ensures an increase in yield. If you want a richer crop and "everything that fits," select Sensi Grow. Do not mix together "Part A" and "Part B"
Add "Part A" separately to the tank, and specifically "Part B"
SENSI BLOOM PART A: total Nitrogen (N) 3% ((NO3) 3%). Calcium (Ca) 3%. Derived from: Calcium Nitrate, Magneisum Nitrate. SENSI BLOOM PART B: total Nitrogen (N) 1% ((NH4) 0,03%, (NO3) 0,94% & uera 0,03%), available Phosphat (P2O5) 2%, water-soluble Potassium Oxide (K2O) 6%. Sulfur (S) 1,3%. Derived from: monoammonium phosphate, monocalcium phosphate, potassium nitrate, potassium sulfate, urea. WARNING! The manufacturer may change the ratio of the ingredients!